We’d love your help. Let us know what’s wrong with this preview of Raising Our Children, Raising Ourselves by Naomi Aldort. An insightful and eloquent guide for parents who wish to raise their children with unconditional love, and empower them to be self-reliant, expressive, caring and able to form close human connections. Naomi Aldort is a parenting and family counselor, writer and public speaker with clients on three continents. Her advice columns appear in parenting magazines around the world. To ask other readers questions about Raising Our Children, Raising Ourselves, please sign up. In reading parenting books, you rarely find one you'll agree with 100%. The trick really is to take the good and leave the bad. The book is a good book if the good outweighs the bad. Raising Our Children, Raising Ourselves did contain quite a bit of good. However, it also contained, in my opinion, an awful lot of bad. I'll start with the good this book had to offer. It is true that far too many people do not view children as people. Our society tends to place them somewhere around a well loved pe In reading parenting books, you rarely find one you'll agree with 100%. The trick really is to take the good and leave the bad. The book is a good book if the good outweighs the bad. Raising Our Children, Raising Ourselves did contain quite a bit of good. However, it also contained, in my opinion, an awful lot of bad. I'll start with the good this book had to offer. It is true that far too many people do not view children as people. Our society tends to place them somewhere around a well loved pet, not a fully formed person. For some reason, the trend has remained that magically at 18 a child becomes a person, capable of having their own opinions only at that magic point. However, that isn't as it should be. This book offers great perspective on treating children as persons, equal persons. Considering their needs and desires as you would the needs and desires of any other person in your life. I wish that message could be sung from the rooftops. Respect children! Treat them like people! I also found many of her communication techniques to work wonders. Simply listening and validating my children has been a big game changer around here. I am listening, I am there for them, but their feelings are their own. I feel that they've been owning their lives more and relying on me a bit less to provide them their happiness or solutions to their negative emotional state. I've noticed a particularly evident change in my older daughter (she's 6) that she feels more "at home" expressing herself these days, good or bad, and she doesn't blame others for her feelings so much. She's also gotten much better at her problem solving skills since I'm not jumping in with suggestions every time she encounters another child who doesn't want to play with her or some other disappointment. So, there is a great amount of good that can come from this book if you have the particular ability to take the good and leave the bad. If you are one that fixates on what is wrong with a book, then this may not be the book for you. Most of the personal stories given in the book seem outright fake. The interactions between parent and child or counselor and parent just don't feel real to me. Perhaps much was condensed so that the point was easily displayed, but the stories just didn't sit right with me. I often felt Naomi Aldort went too far. That she had a good point and I was with her, until she went too much to the extreme and threw the point off a cliff. It seemed many of her points went from me nodding in agreement to saying, "Whoa Naomi! Too far. Too far!" I feel like I took her basic points and then had to throw the rest out of my head. I felt like she was asking the impossible at times. I get that "power games" (where a child empties the garbage over and over while you pick it up while play acting that is is a big deal, but not trying to stop the child) can be a good tool for kids who are feeling a bit helpless, I just don't have the time or the energy to play anytime my kids says to. I cannot possibly come up with the energy to chase my 3 year old around every evening at bedtime so he can feel powerful. Often I just don't have the time for a game of throw the sippy cup on the floor. There were multiple point like that that could make a parent feel like a big, fat failure because they just can't do that today or right now. Dr. Aldort and I also disagree on expectations. I know that my living room being relatively clean is my goal. Dr. Aldort feels that as such, it is my responsibility to keep it that way and should my child trash it, I can verbalize my wish that it be clean, but I cannot expect them to help clean it. In my world, family just doesn't work that way. We all have to pitch in and do what helps the whole. There are many goals that my children have that I help meet. Likewise, I expect their participation and cooperation with some of my goals. I don't expect them to steam clean the carpet or keep all the toys on the shelves at all times. I do expect that they pick up their own things when they are done with them and that they pitch in on family cleaning day for the good of all. Mom is not a slave. Community works when everyone works for all, not just when they personally see benefit. I was also very confused when Dr. Aldort told me I should not praise my children. She seems to believe scolding nor praise should take place. Everything should be matter of fact and avoid trying to steer them on way or another. I want praise when I accomplish difficult things. I anticipate my children wanting the same. I think this is just one instance of Dr. Aldort throwing out the baby with the bathwater. Some people use praise to coerce their children toward certain things. So, no one should praise their children. I think that is very short sighted. I think praising a child in the things the child is proud of or does well is a good thing. And I can't imagine stopping myself from telling my daughter the picture she spent hours making is lovely because I don't want my daughter to think I only want her making such pictures. That's just silly. It's a three part investigative series that proves without a doubt that Naomi Aldort has deliberately deceived her readers. I hope this information is useful to anyone else who has been hurt by Aldort's misguided advice. Tek kelimeyle harika bir kitap. Çocuğumuza nasıl davranmamız gerektiği ile ilgili sunduğu bakış açısı insancıl, mantıklı ve tam da olması gerektiği duygusu uyandırıyor. Aldort has some good points and suggestions, but this wouldn't be a parenting book if it didn't come across as a little self-indulgent and heavy handed. I took a lot away from reading it, but much of it seems unrealistic and unfounded. The worst part being, of course, the rather stilted but supposedly real dialogue between parents and kids. It's worth reading, but make the suggestions work for you, don't just take it as a parenting bible. So helpful for helping our children--and ourselves--handle our emotions. This book was amazing and totally changed the way I respond to relationships in my life, be it my husband, children or friends. A wonderful book! So far it's all right. I think it has a lot of valid points regarding not shutting kids down. She promotes letting kids express themselves, and validating their emotions instead of getting caught up in your own reaction. I think it's a complicated relationship... you don't want to create combative situations with children, but you also want them to do things like eat their dinner... I'm confused. I'm passing it on to my sister, who is rethinking her parenting strategy in te So far it's all right. I think it has a lot of valid points regarding not shutting kids down. She promotes letting kids express themselves, and validating their emotions instead of getting caught up in your own reaction. I think it's a complicated relationship... you don't want to create combative situations with children, but you also want them to do things like eat their dinner... I'm confused. I'm passing it on to my sister, who is rethinking her parenting strategy in terms of controlling behaviours. I'll be curious what she has to say about the book as it will be less theoretical for her (she has a son). In general, I found the book to be pretty great. There are so many valid points about raising autonomous children who don't act out of guilt, but love. I agree with most of her points about respecting the desires of children, and about being there for them... but it would really require a stay-at-home parent. I really enjoy her S.A.L.V.E. technique in that it focuses on listening to the child and acknowledging their feelings instead of telling them that things are 'okay'. She puts a lot of emphasis on a child's ability to work through stress/difficulty, and the importance of that. We are not here to deny feelings by telling them that things are okay, or to fix problems for them. We need to be raising autonomous individuals who can recognize that a difficult situation is not the end of the world. The one sticking point me, is the idea that a child does not have to clean up their own mess. I understand the point of power play, making a game out of a situation where a child keeps throwing the lego all over the floor (it's important for them to feel powerful sometimes, and it's better for that to happen in the home rather than out of it). However, she suggests that we should just state our feelings, "I feel upset that the milk is all over the floor. I'd love if you'd help me clean it up." If the child says no, we are supposed to respect that. She feels that we wouldn't want the child to help us out of guilt, but to approach cleaning from a loving place. She suggests that cleaning out of guilt would create an unhealthy connection with cleaning, and a feeling of shame/unsafeness around the parent. S = Separate yourself from your child's behavior and emotions with a Silent Self-Talk. The key idea here is to think before you act. A = Turn you Attention to your child. L = Listen to what your child is saying or to what his actions may be indicating. V = Validate your child's feelings and the needs he expresses without dramatizing and without adding your own perception. E = Empower your child to resolve his own upset by getting out of his way and trusting him. I, however, would find it more useful to Empower your child to resolve his own upset by Exploring the options for resolve together. I have been using this formula with my 3 year old, and it really helps me to be more patient and more loving in situations where I might otherwise overreact and thereby induce fear and diminished self-worth in my child; conversely, trust and self-confidence are increased when I react in this manner. Adolrt further expounds on the S.A.L.V.E. formula as she discusses the five primary needs of children: love, self-expression, emotional safety, autonomy and power, and self-confidence. I find her many examples used throughout the book helpful illustrations of interactions between parent and child. I only made it through the first few chapters and then skimmed the rest. There are definitely some helpful insights in this book, but for the most part I found the hyper-analysis of situations/interactions exhausting and the dialogues that were supposedly based on real-life seemed cheesy and implausible. I think it's a little too far in one direction for me. I parent with compassion and I don't coerce and bribe or guilt my kids, but I also do set limits. I don't have time to play a power game in which I pick up all of my recycling 24 times until my kid is fulfilled. This is the single best parenting book I have ever read. Kind of new-age-ish, but that is my style. Life changing. This is one of the parenting books that I will reread every year or so just to remind myself how to be a good parent. This book is really filled with great advice which I couldn't agree more. I think any parent should take time with their kids instead of reading "how-to-raise-your-child" books. Take a walk at the park, its much more valuable. We are a generation grown up with tecnology, and used to "how-to" books an manual. We are a generation of parents who want to make everythig "perfect" for aour children. Well, its time to accept the fact - there is no "manual" about raising a child. No one has to give us instructions, no one should give us instructions. We cant be "perfect", its ok to make mistakes. Time to face it, cry about it or whatever and move on. Be loyal to your kids. Be a badass defender of your kids. Dont systematically undermine your kids. Funny that we should need a book to tell us this but in this culture we really do. Aldort is a badass mom who totally makes you listen to your gut and helps you to part with those furtive modes of violence that your learned from your own parents and from teachers growing up. revolutionize your parenting and make the world a better place for yourself, your kid and everybody else. Probably the best parenting book I have ever read! Her concepts are similar to Marshall Rosenberg's or Alfie Kohn's, but as a therapist herself, she gives plenty of concrete examples. I wish I had read it when pregnant with my first child. Ohledně téhle knížky jsem hrozně rozpolcená. S některými myšlenkami strašně moc souhlasím a s některými vůbec. Spousta věcí takhle podle mě vůbec nefunguje, ale k přečtení a zamyšlení je to docela dobrý materiál. 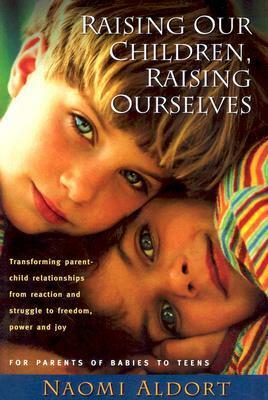 Naomi Aldort's Raising Our Children, Raising Ourselves is a must-read for any parent. The thrust of the book is that children deserve the same respect and understanding that we give to adults. But then it's jam-packed with information on how to do that, even when everything looks absolutely hopeless. And with real-world examples that show just how well that respect actually works, it's easy to see why giving your children this respect works so much better in the long run than the disciplinarian Naomi Aldort's Raising Our Children, Raising Ourselves is a must-read for any parent. The thrust of the book is that children deserve the same respect and understanding that we give to adults. But then it's jam-packed with information on how to do that, even when everything looks absolutely hopeless. And with real-world examples that show just how well that respect actually works, it's easy to see why giving your children this respect works so much better in the long run than the disciplinarian and controlling parenting that me and most of my peers grew up with. Separate yourself from your child's emotions with self-talk. What the hell is self-talk? You know, when your toddler throws the blocks all over the room and your first reaction is, "Damn it! I don't want to clean that up again. Get over there and pick them up!" ... well, you say that to yourself instead of out loud. Acting like that isn't true to your own nature, nor is it the way you really feel about your child. Attention on your child - once you've let your own emotions pass, put your attention on your child. Listen to what your child is saying. What he/she is saying might be just as much with body language as it is with words. Why is he acting like that? What made her so upset. Pay attention to what your child is really trying to communicate to you. Validate your child's feelings. I really learned something in this part - validating feelings is just that. You express that you understand that the child feels the way he/she does. You don't negate the emotion. You don't add to it. You just express that you see that your child feels hurt. Or angry. Or frustrated. Or whatever. It isn't your place to determine whether this is the correct emotion to feel. That takes your child's autonomy away. Empower your child to work through those emotions by stepping back and getting out of the way. Talk about parenting! It's not up to you to solve her problems or get him out of trouble. Your child has much more capability than you suspect (I've learned this through experience with my own children). If they need help, they'll ask. Otherwise, trust that your child can work it out. That alone makes this book worth reading. The book covers how to apply that formula to your child and his own special needs. This wasn't a compelling read for me, I admit I got 1/2-2/3 of the way through and ran of renews at the library, I didn't like it enough to want to check it out again to finish. It was an interesting approach to parenting, in my opinion too child-centered (never say no parenting), and not very realistic. It would probably work better in a small family with 2 children that are a couple of years or so apart. I prefer parenting books that give more concrete ideas for influencing behavior and exampl This wasn't a compelling read for me, I admit I got 1/2-2/3 of the way through and ran of renews at the library, I didn't like it enough to want to check it out again to finish. It was an interesting approach to parenting, in my opinion too child-centered (never say no parenting), and not very realistic. It would probably work better in a small family with 2 children that are a couple of years or so apart. I prefer parenting books that give more concrete ideas for influencing behavior and examples of how to use them when poor behavior occurs (which seems to come naturally to my children and most I know). I really enjoyed this book. While I did not agree with everything in it, found it thought provoking. It facilitated insights into some of my own parenting behaviors, how my own history effects my reactions to my children, and helped me to feel more choiceful about my parenting choices. I took notes while reading this and am continuing to explore myself and my reactions related to some of the authors discussions. Really, what more can you ask for from a parenting book. Really beautiful stuff about how to use validation and awareness to support our children's emotional growth. I feel that some of the negative views are from those unfamiliar with these approaches, who assume that there are no boundaries with this style of parenting -- despite Naomi discussing boundaries and creating safe environments throughout the book. I highly recommend this to anyone who loves the work of Alfie Kohn, Daniel Hughes, Heather Forbes, or other such authors. Prozatím nejlepší kniha o výchově, kterou jsem četla. Srozumitelná s velmi praktickými příklady. Pěkné ukázky situací z pohleud dítěte. Z počátku mohou být absurdní, ale v důsledku pravdivé a poučné.